The Internet Archive is widely regarded as the largest online repository of free-to-share media. The site hosts millions of public domain and Creative Commons licensed files, many of which can be downloaded through BitTorrent. In recent weeks, however, the Internet Archive has been flooded with more dubious content. Searching the site for the titles of Hollywood blockbusters now results in long lists of seemingly pirated movies. With names such as “World War Z 2013 DVDRip Xvid AQAS” and “The World’s End full movie part 1 Xvid” it is safe to say the files in question are not in the public domain. However, on closer inspection it turns out that these titles are not being uploaded by pirates who want to spread free movies, but by scammers trying to earn hard cash through the Internet Archive. Those who try to download or stream the movies in question will soon notice that it’s not as straightforward as it looks. The “scam” uploads come in different shapes. 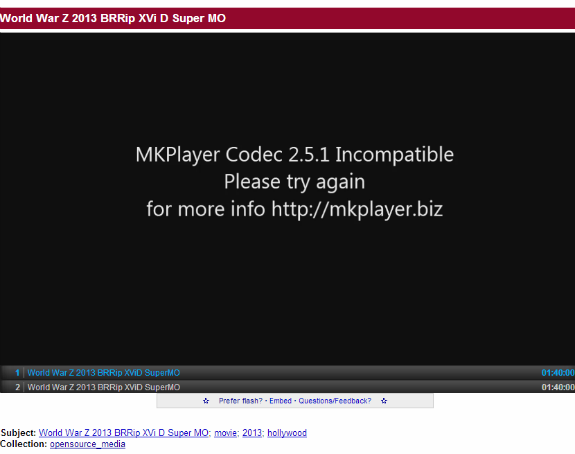 Some have actually uploaded what looks like a movie file, but one that requires a special software such as the MKPlayer illustrated in the image below. Needless to say, this is just a money-making scheme designed to lure people into downloading suspicious software. Another trick scammers use is the YouTube video screenshot. The page pictured below suggests that you can stream the film Epic directly from the Internet Archive, but those who click play will notice that it’s just an image which points to an external streaming site. Whether the third-party sites do indeed stream these movies is unknown, but they do ask for the credit card details of those who are gutsy enough to give it a try. Several movie links point to to the same page at Cinemablast.info with fake user comments. When the “film” starts playing a notice pops up saying that the film was approved for all audiences by the non-existing Independent Film Rating Association of America, instead of the MPAA. After this notice visitors are redirected to the pay site. 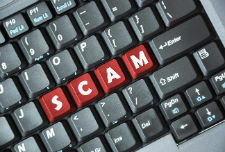 While these type of scams are nothing new for the average BitTorrent search engine, this is the first time we’ve seen them abuse the Internet Archive.